Jackie won a 4-night, 12-dive package at Maluku Divers in Ambon, Indonesia! The story: I was at this site to document the advancement of Sea Star Wasting Syndrome. While only at 3 m depth, I looked up because of the glinting sunlight. 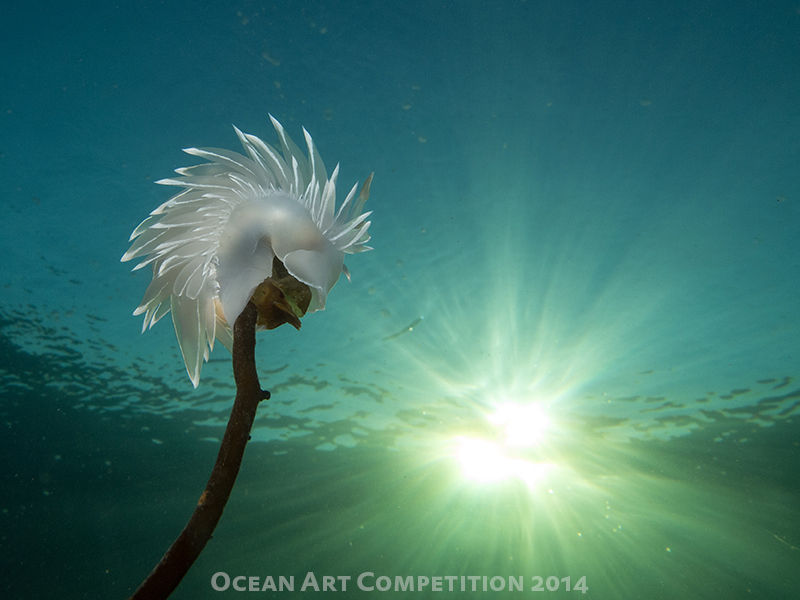 It was then that I spotted the Alabaster Nudibranch on the kelp, slowly advancing upward. I positioned and waited, desperately hoping that s/he would continue to the top and that the sun’s rays would then be streaming down. I saw the potential of the shot to raise awareness about the astonishingly beautiful and fragile life hidden right below the surface of our dark ocean. It took about 5 minutes, the sunlight flickering on and off . . . and it all came together, allowing me to capture this stunning moment. Species: Dirona albolineata to 18cm length. Camera: Olympus E-PL2, Olympus housing, Olympus 14-42 lens, dual Inon Z240 strobes.